FORT MYERS, Fla. – At a press conference in Ft. Myers today, Chief Financial Officer (CFO) Jimmy Patronis announced the arrests of 10 individuals in an alleged $42.7 million insurance fraud ring. Jorge Valido, a former Miami doctor and primary figure in the fraud scheme is still at large. Valido, who was previously indicted for healthcare fraud, and his associates are alleged to have stolen doctors' identities, illegally obtained insurance information and billed $42,742,852 in fraudulent medical services. 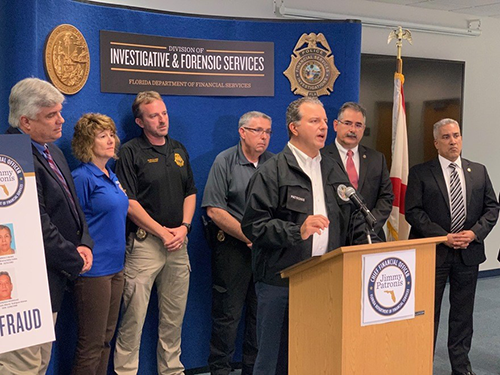 An investigation by CFO Patronis’ fraud detectives revealed that 14 individuals submitted 23,708 claims to insurance companies, containing over 20 different physicians' stolen identities for fraudulent services from 2015 to 2018. Claims were listed as originating from 15 “phantom clinics” with addresses in the Fort Myers, Tampa, Lake Worth, Boca Raton and Miami. These fake clinics had physical addresses to function solely as drop boxes for insurance payments. In total, $42,742,852 in fraudulent claims were submitted to insurance companies for payment. The National Insurance Crime Bureau (NICB) and Attorney General Moody’s Office of the Statewide Prosecutor assisted in this investigation. Maylene Cruz, Xiomara Baullosa, Jorge Valido Leyva, Anais Hernandez Jorge, Nivardo R. Parra, Nestor Damian Rodriguez, Nestor Rodriguez, Luis Eslen Machado, Sandra Efigenia Nadal Hidalgo, and Enrique Galera-Risco were arrested and/or charged on February 6. Jorge Arnaldo Valido, Arnaldo Valido, Minerva E. Valido and Gonzalo Rodriguez are all still at large. All parties face charges of scheme to defraud, money laundering, insurance fraud, criminal use of I.D., and RICO.